Things are about to heat up with the Doritos Flamin Hot Instant Win Game. Visit doritosflaminhot.com and play for your chance to instantly win daily cash prizes. Hot streaks, hotter prizes. 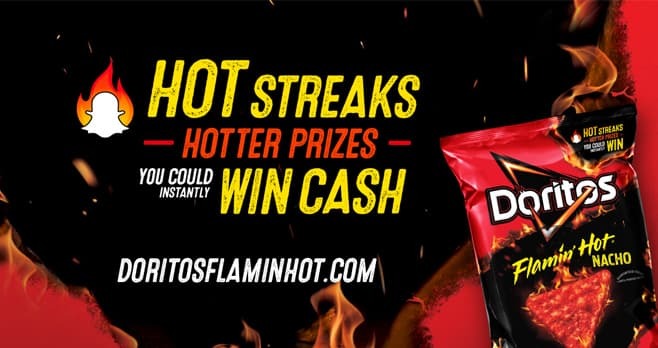 The Doritos Flamin Hot Instant Win Game is open only to legal residents of any of the fifty (50) United States and the District of Columbia, who are seventeen (17) years of age or older at the time of entry. The Sweepstakes begins at 12:00:00 p.m. (noon) CT on February 11, 2019 and ends at 11:59:59 p.m. CT on April 7, 2019. Limit one (1) Combined Code submission per person/email address per day. The grand prize consists of $5,000.00, awarded via wire transfer or check, payable to winner. Visit www.doritosflaminhot.com to enter and see Official Rules for details.